The most common side effects of Enbrel include weakness, lightheadedness, coughing, heartburn, stomachache, itching, pain, swelling, and blistering skin. Other more serious side effects may occur when taking Enbrel, in the event of which, you should contact your doctor immediately. Most of these side effects can be avoided merely adhering to the instructions. A slight overdose can cause some uncomfortable side effects, as can failing to take enough. If any of these symptoms are persistent, irritating or unusually severe, be sure to contact medical help immediately. Any side effects such as these should be investigated and treated by a healthcare professional. Don’t wait until the symptoms are overwhelming to ask for help: ask for help at the first sign of a bad reaction. 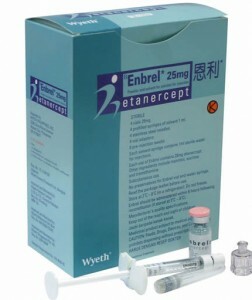 Side effects associated with Enbrel (Etanercept) can cause permanent damage in some instances. Adults who have received injections of Enbrel are more susceptible to contracting life-threatening diseases such as lymphoma, skin cancer and leukemia. Adults who didn’t take Enbrel were less likely to suffer from any type of cancer. Enbrel can cause other symptoms that may not be listed. If they are not treated immediately after being identified, permanent impairment can occur, and taking Enbrel over a long period of time heightens the possibility of developing cancerous tumors. Your doctor will need to know if you are taking either of these types of prescription drugs. If you are pregnant or plan on becoming pregnant, discuss the possibility of either disbanding the use of Enbrel during pregnancy or decreasing the dosage. Enbrel is often prescribed to the elderly because they are frequent sufferers of autoimmune disorders like arthritis. Side effects can be more severe in the aged merely because their immune systems are weaker than younger patients. It heightens their risk for contracting bacterial infections, as well as well as fungal infections. It is more difficult for the elderly to fight these negative Enbrel side effects off. In addition, cuts or open wounds are more inclined to become infected while the patient is under the influence of Enbrel. Harmful side effects should be seriously considered before prescribing Enbrel to an elderly patient. One of the most threatening Enbrel side effects is Autoimmune Hepatitis. Liver dysfunction can occur in people who take TNF inhibitors; therefore it is recommended that patients undergo frequent liver checkups while consuming Enbrel. This can ultimately lead to liver failure and death if Enbrel is taken over a prolonged period of time. Enbrel is a TNF inhibitor aimed at lessening chronic pain for those suffering from arthritis and other autoimmune disorders and diseases. Enbrel should be stored in the fridge, although it should never be frozen. Keep the syringe and injection devices in their boxes – this allows them to remain sterile – and keep them out of the light. Always throw away outdated medication. As with any autoimmune drug, taking Enbrel will decrease your body’s ability to fight disease and infection while you are under its influence. It is important to avoid environments that are breeding grounds for pathogens.